L 14 1/2″ (37 cm) W 30″ (76 cm). Description: Sexes similar. Breeding adult has orange-red bill with black tip; orange legs; black cap and nape; long forked tail; medium gray above and paler below. 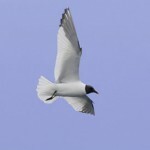 In flight, a black wedge is usually visible near tip of upperwing.Non-breeding birds have incomplete black cap, with a white forehead; and bill color varies with age. 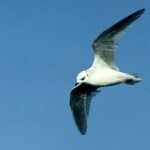 Habitat: Lakes, reservoirs, and rivers are used by migrants most frequently. Migrants are found less often on smaller marshes and ponds. Where in Nebraska: Uncommon to rare spring and fall migrant in the eastern part of the state, becoming even rarer in the west. No breeding records for the state. 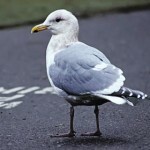 Status: The true status of this species is uncertain because of frequent confusion with Forster’s Tern. 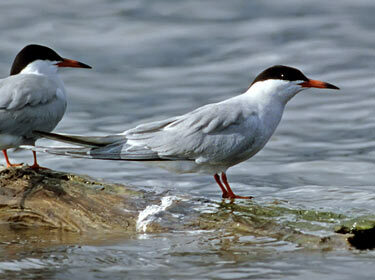 Fun Facts: The Common Tern is sometimes called the sea swallow.